Musical Position: harpist and soprano soloist. Helena is documented as being one of the most outstanding musicians from Chatham and has travelled far and wide making a name for this city through her charm and abilities. Recent work: Helena has performed in many places in the U.S.A. under the direction of the Orpheum circuit and the Publix Productions of New York City. She is currently in L.A. for the winter of 1927. 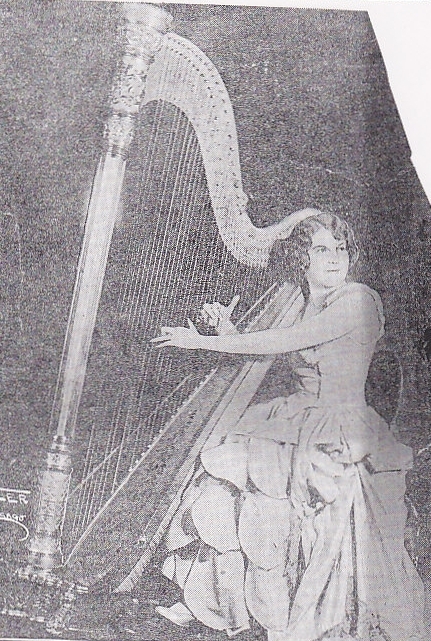 There is an article on Helena in the CDN Nov.9th 1927. The above photo was printed in the same article noted. Every bandsman or individual who wishes to become a bandsman is invited to meet at the armouries tonight. The leader of the Kilties brass band will be there to meet everyone in the band room. Mr. Worth made the public announcement. A.E. Herman at the Royal Bank will be accepting donations on behalf of the band. Above Quote from the CDN 1927, Dec 19th issue. 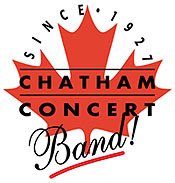 The Chatham Concert Band was organized in 1927 and in 2002 celebrated 75 years of continuous operation. The Band members are musicians from the local area and perform at weekly concerts, parades, church services and other activities as requested. The Band provides a source of musical education for young people. The organization is culturally diversified and believes that all children interested in music should have the opportunity of learning instrumental music without financial restraints. The youth band programs currently instructs 150 students each Saturday during the school year. The youth groups participate in the local Kiwanis Music Festival and have been very successful over the past years. The organization has subgroups that perform for smaller or on request functions. These are the Dixie Cats (Dixieland music), the Hungry Five Polka Band, Jingle Bell Rovers Christmas Band and the Primitive Roots Jazz Band, an 18-piece stage band for dancing. 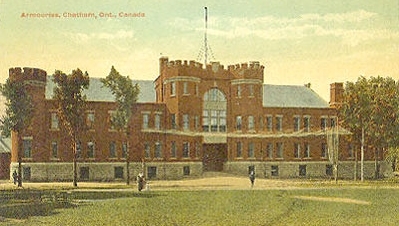 Over the years, the Band has performed for the Queen of England, various Prime Ministers, Ontario Premiers, the R.C.M.P Musical Ride, and at the Canadian National Exhibition. Members of the Band are volunteers and range in age from pre-teen to 80+. We have a co-ed membership from all economical statuses and careers. Currently there are 40 active members in the Senior Band and 150 members in the youth groups. Attendance at the Band’s Summer concerts average 750 to 1000 people. Attendance at the other functions depends on the locations. Audiences at parades are not easily determined. The Band currently receives financial support from the two Optimist Clubs in Chatham to help fund our youth programs. The Band also receives a grant from the Municipality of Chatham-Kent. The Municipality also provides maintenance, hydro and water for the municipally owned Bandshell in Tecumseh Park, Chatham, Ontario. You are currently browsing the archives for the 1927 Music category.